AMES, Iowa (January 4, 2018) – The Iowa State University Startup Factory today announced its fourth cohort of entrepreneurs to enter the Ames-based program and the launch of the Startup Factory Network and its inaugural cohort. Twelve teams will participate in ISU Startup Factory’s fourth cohort and 11 teams comprise the Startup Factory Network cohort. 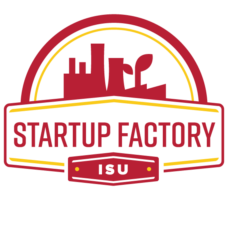 The ISU Startup Factory is a 52-week intensive program housed at the Iowa State University Research Park that provides an avenue for students, faculty, and staff to create technology-based businesses. Entrepreneurs in the program receive formal training, resources, and access to a network of business mentors, advisors, counselors, and investors in two 26-week blocks: the first a formal curriculum centered on business validation, and the second, customized to their individual business needs. Earlier this year, the ISU Research Park announced a $200,000 grant to enable the Startup Factory to expand its program and impact elsewhere in the state. To that end, the Startup Factory partnered with Iowa Small Business Development Centers (SBDCs) and community colleges in northwest Iowa to pilot the Startup Factory Network to bring regional clients additional programming. SBDC State Director Lisa Shimkat agrees the partnership will raise the bar for small businesses and entrepreneurship regionally. Johansen said the Startup Factory provides a clear “front door” for accessing resources and a scalable system for developing and supporting startup companies. Services the Startup Factory team will provide include site consulting and planning; train the trainer; and programming. The Startup Factory Network cohort will also have access to the Startup Factory’s mentor and investor network, and facilitated access to other resources available through Iowa State University. Johansen said after the kickoff event, programming will shift to the established weekly format where ISU Startup Factory cohort members receive in-person training at the Startup Factory space in the Research Park; whereas, the Startup Factory Network sessions will be delivered via videoconferencing. The program will conclude with a final onsite presentation and graduation in Ames.